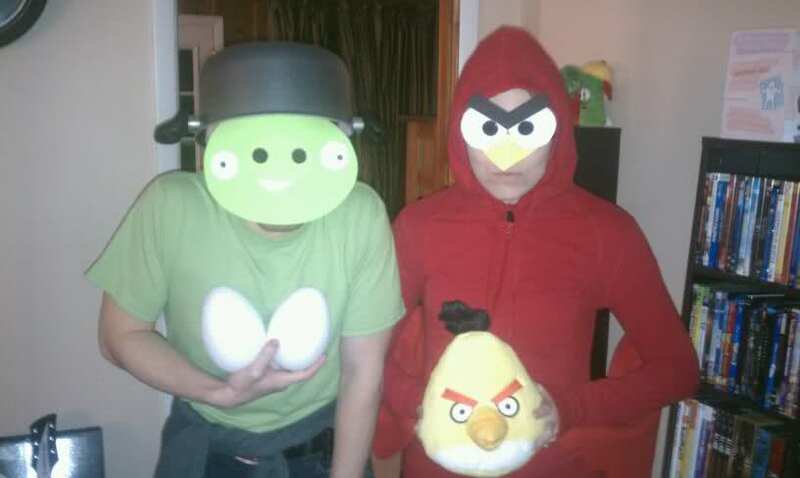 I’ve seen a few licensed Angry Birds costumes online this year, and while they’re cute, they’re bulky, difficult to move in, and expensive considering that you’re paying for, essentially, a giant foam sack with arm- and head-holes and an angry bird (or evil piggy) face on it. “The masks were a base of sunglasses from Goodwill (50c each) and craft foam ($1-2). We just glued the foam onto the sunglasses, leaving the pupils open over the lenses so we could see. The eyes of the bird and the pig we just drew and then layered the foam to make the face. The only fiddly bit was getting the angle of the beak right, but in the end it worked perfectly just gluing it to the underside of the nose groove.